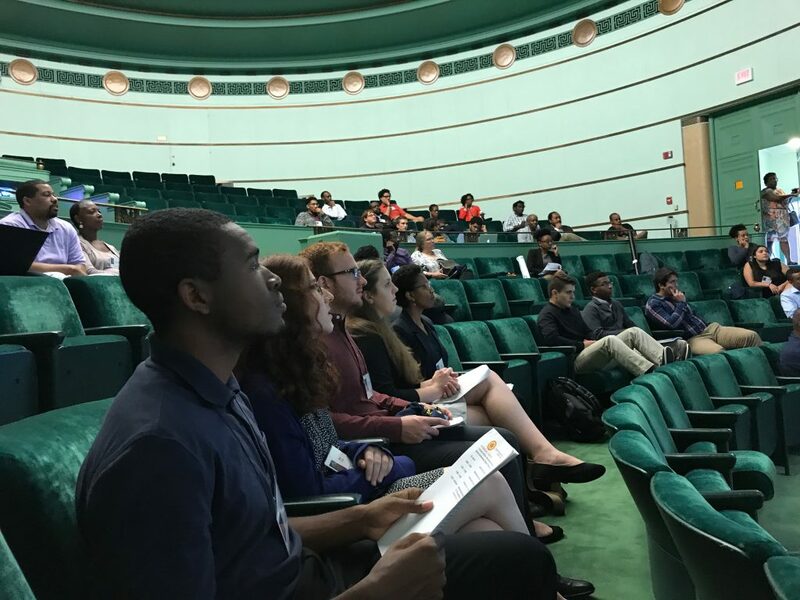 Over 90 students and researchers attended this year’s Conference for African-American Researchers in the Mathematical Science (CAARMS), proudly sponsored by Michigan Engineering and supported by Robert J. Vlasic Dean of Engineering, Alec D. Gallimore. The Michigan Institute for Data Science is a secondary sponsor. 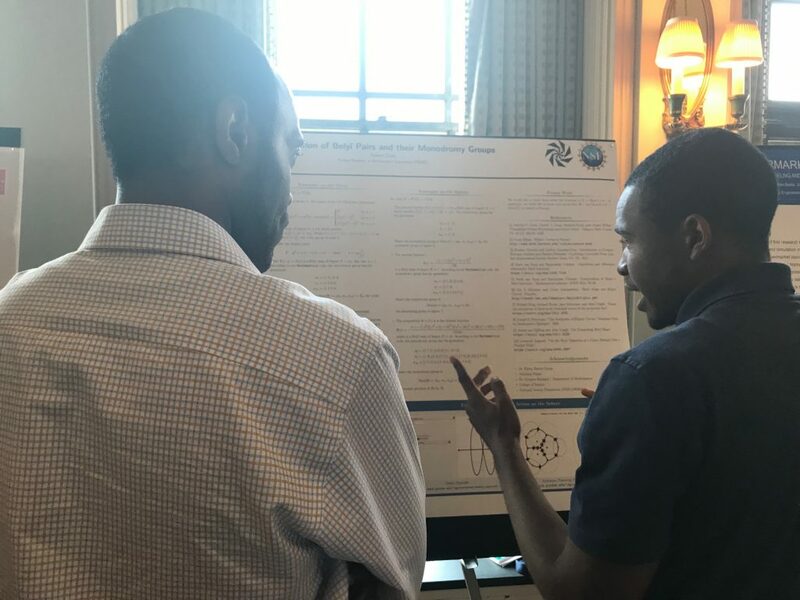 Students attended expert workshops such as the J. Ernest Wilkins Workshop for Future Researchers and presented their own research to an elite conference audience. 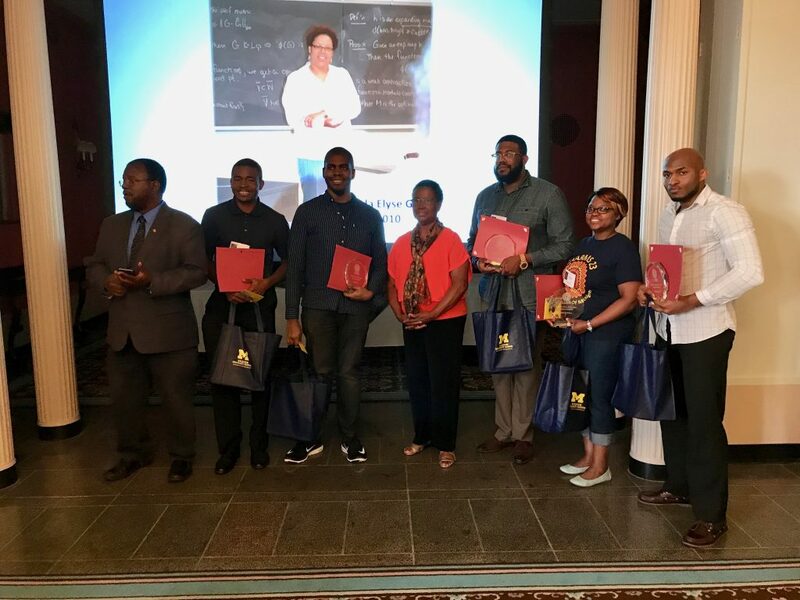 All attendees—students and faculty—learned from African-American faculty and industry professionals from across the United States, including through lectures from distinguished Michigan Engineering alumni like Dr. Kyla McMullen. McMullen was the first African-American woman to receive a Ph.D. in computer science from the University of Michigan. Other Michigan Engineering alumni lectures were delivered by Professors Todd Coleman of University of California at San Diego, Craig Sutton of Dartmouth College and Todd Shurn of Howard University. 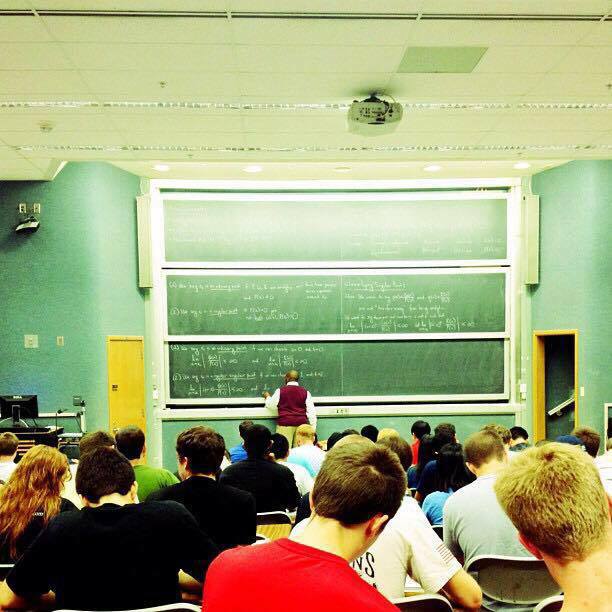 Experience it all from the point of view of Professor Edray Goins, Purdue University. 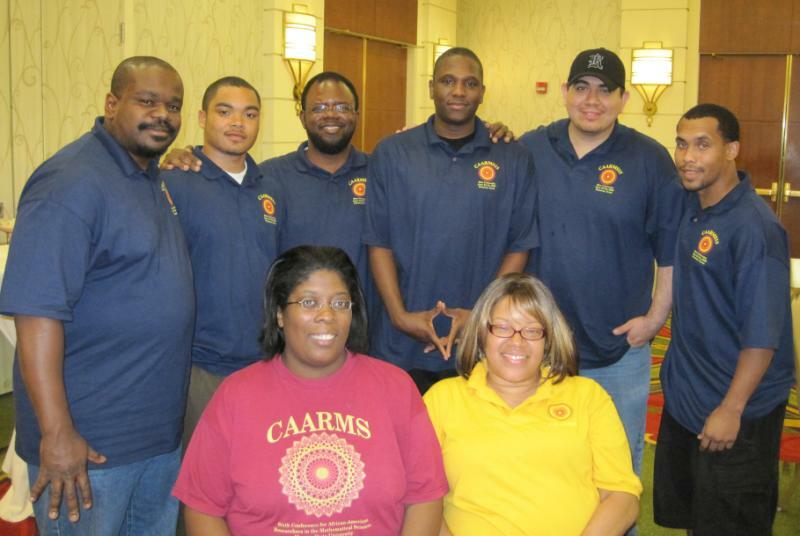 The 23rd Conference for African American Researchers in the Mathematical Sciences (CAARMS) was held from June 21-24, 2017 at the University of Michigan. This annual event features research talks by African Americans throughout the country. This year’s CAARMS felt like a homecoming of sorts for me. 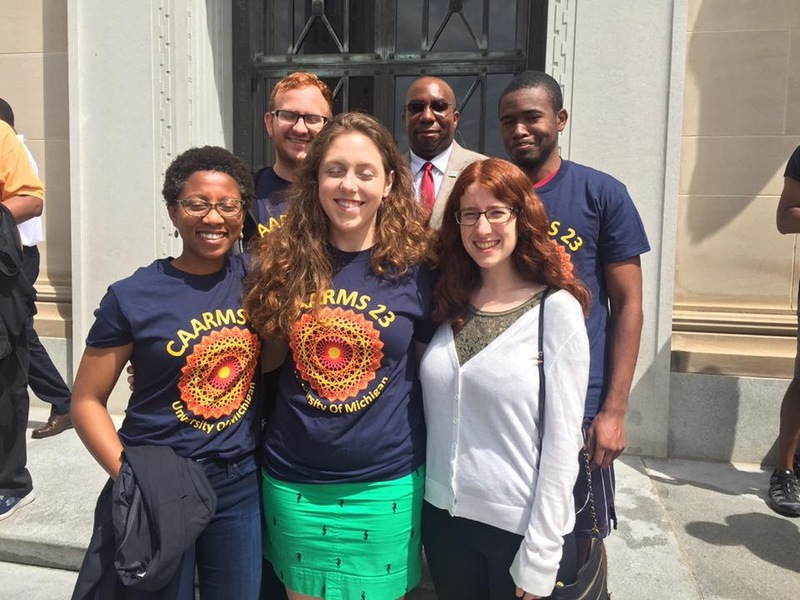 The last time CAARMS was held at the University of Michigan was 1999 — when I was a graduate student at Stanford University. Some 18 years later, I am now a full professor of mathematics who is bringing his own students to attend CAARMS. CAARMS is unlike any other conference in the mathematical sciences. 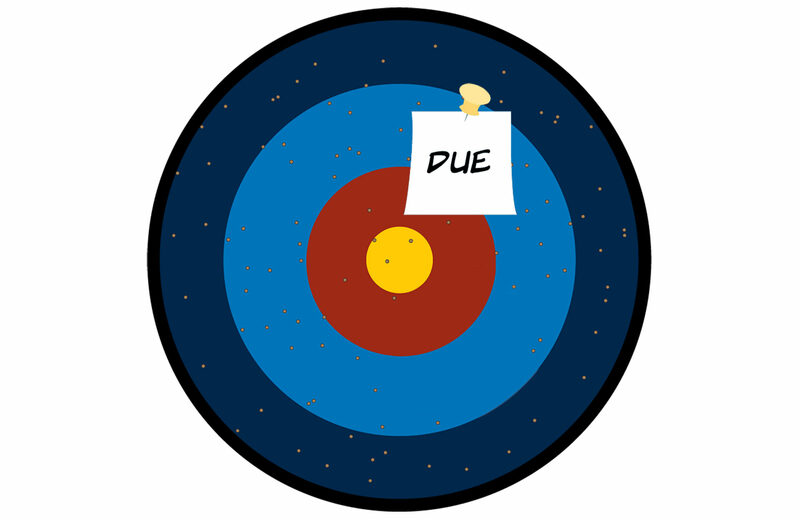 Many times, math conferences are either very narrowly focused on one subject or their topics are so broad that speakers fail to grasp the meaning of request “prepare your talk for a general audience.” CAARMS interprets “mathematical sciences” very loosely: the talks aren’t necessarily given by mathematicians but they are given by scientists who use mathematics on a daily basis. And the talks are of very high quality! 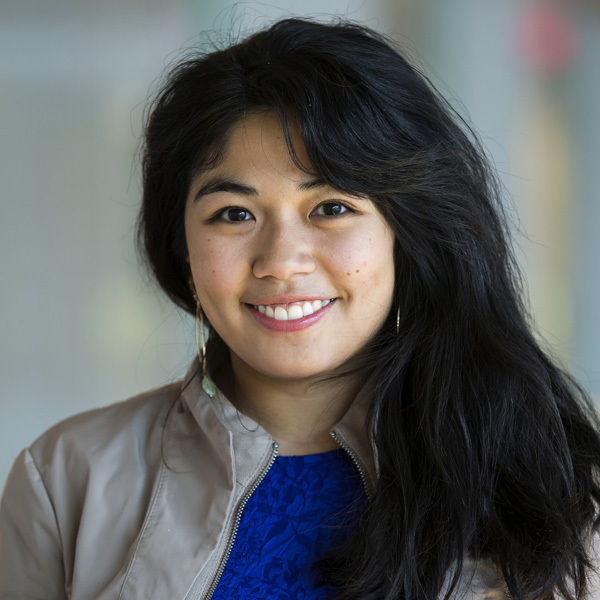 This year, the theme throughout the 4-day meeting was “Data Science.” Even though this mathematical zeitgeist causes nearly as much angst as “big data“, I thought this was an excellent topic for students and faculty alike to learn more about. 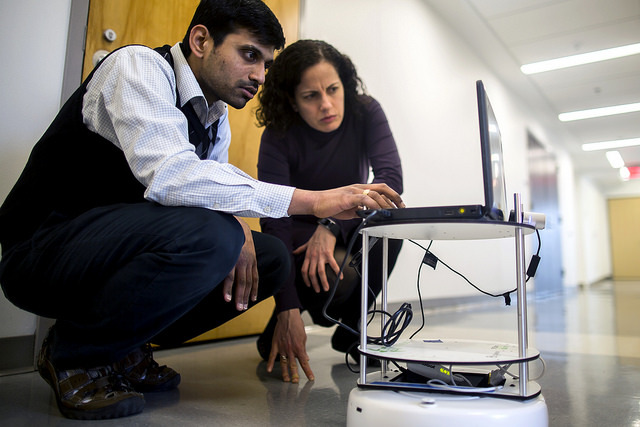 The first day of CAARMS featured a series of tutorials meant for undergraduates, while the second and third days focused on talks given by researchers in the mathematical sciences. The first official day of the conference was spent giving undergraduate students an overview of Data Science and some of the mathematics which goes into it. Robert Hampshire (University of Michigan) and Bill Massey (Princeton University) took turns running several hours worth of tutorials. But this is not as boring as it sounds: Robert and Bill are like a father and son comedic duo, nearly completing each other’s sentences while barely being able to contain each other’s excitement about showcasing wonderful real-world applications of the material. Robert Hampshire spent some time discussing the importance of the Rao-Blackwell theorem, proved in 1947 by African American statistician David Blackwell. The poetic nature of this scene really touched me because, just a year ago, I invited Robert to give the MAA-NAM Blackwell Lecture in Columbus, Ohio as part of the 2016 MAA MathFest. After a long day of learning about statistics and its applications, we were treated to mathematics and jazz. That evening, just across the hall from the conference room, there was a welcome reception. Marcus Miller led a performance-based discussion tying mathematics and music. During the event, I sat next to two jazz aficionados David Goldberg and Phil Kutzko. We remarked how great this was to focus on an analysis of music that wasn’t Eurocentric. Not to take anything away from the work of notable scholars of the relationship between mathematics and music, such Dave Kung or David Wright, but it’s nice to see more of an analysis of mathematics and jazz, much along the lines of the way Stephon Alexander studies the relationship between physics and jazz. The next day brought the research talks in earnest. Electrical Engineer Todd Coleman (University of California at San Diego) led the second day with a talk entitled “Electrical Digestive Engineering.” (Todd hosted CAARMS19 when it was at UCSD in 2013.) I found this talk incredible. He discussed how to model digestion in the stomach using a form of Maxwell’s Equations in cylindrical coordinates. Todd’s research combines medicine (as he works with doctors to learn how the stomach is really not in the same place for everyone), mathematics (as he wants to model the wave of electrical impulses which causes the stomach to push food towards the intestines), and electrical engineering (as he wants to build a device which measures these impulses in order to determine whether someone is digesting food properly). 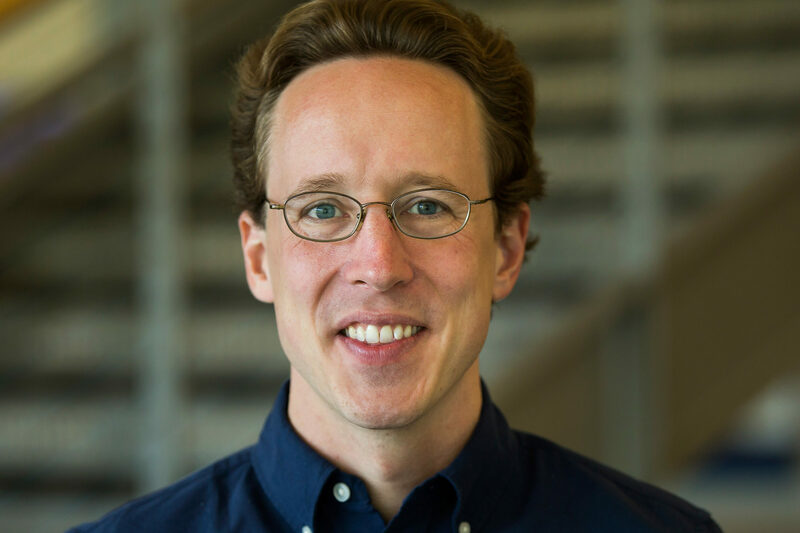 Mathematician Craig Sutton (Dartmouth College) gave a talk entitled “Can You Hear the Length Spectrum of a Manifold?” He discussed a variant of Mark Kac’s famous paper. Craig’s talk was perhaps the most mathematical of the entire conference. He discussed the spectrum of eigenvalues of the Laplacian for a compact Riemannian manifold, but then asked which structures (such as the genus, homology groups, or curvature) one can determine from the spectrum alone. And I was happy my students were paying attention because we had studied Riemann surfaces just the week before! 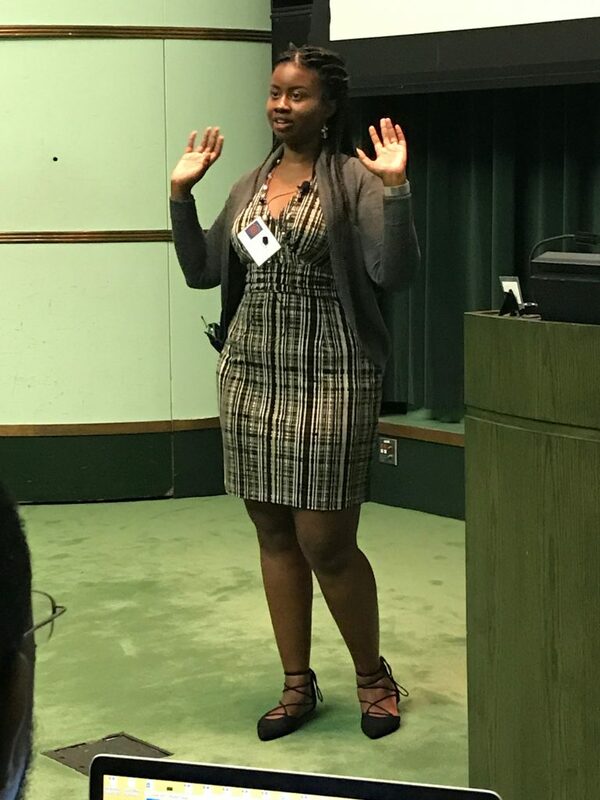 Mathematician Cassandra McZeal (Exxon-Mobil) gave a talk entitled “Optimization and Analytics Applications in the Oil and Gas Industry” which discussed some of the mathematics employed by the oil company. I like to think she was partially invited to give a talk because she was featured in a 2016 television commercial! Computer scientist Hakim Weatherspoon (Cornell University) discussed the future of cloud-based services with as Amazon Web Services in a talk entitled “The Supercloud: Opportunities and Challenges”. He posed a very simple question: say you have all of your data stored in the cloud using one company – and that data is in constant use. Think Netflix using AWS. How easy can we make it to transfer all of this data to a different cloud-based service — but without any downtime for the consumers? Hakim did some fascinating real-time transfers to showcase the technology he’s developed. Statistician Jacqueline Hughes-Oliver (North Carolina State University) discussed a way to improve the work on classifying genes based on a massive graph in her talk entitled “Gene Expression Data Analysis Using the Gene Ontology”. According to Wikipedia: “As of January 2008, Gene Ontology contains over 24,500 terms applicable to a wide variety of biological organisms.” Jackie, working closely with pharmaceutical companies in North Carolina, performed a statistical analysis of this classification to see how efficient this classification truly is. Her talk was probably the closest to a discussion of analyzing “big data”! That evening, there was poster session. 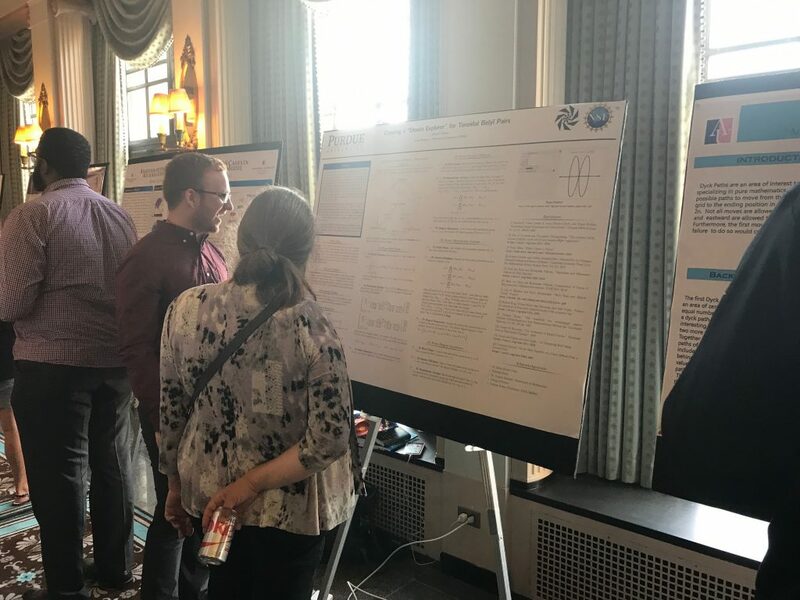 Undergraduates and graduate students presented some 20 posters in areas as diverse as algebraic geometry, commutative algebra, graph theory, operations research, optimization, and statistics. The session is named in memory of Dr. Angela E. Grant, a longtime attendee of CAARMS who passed in 2010 at the age of 36 from breast cancer. Finally my own students could present their work! And did I mention that my own students could present their work? Kyla McMullen (Florida University) led the third day with a talk entitled “3D Audio Perception and Applications.” She discussed the challenges of using a headset to give the user an impression of directional-based audio. Statistician Karen Hicklin (University of North Carolina) discussed how to use mathematics to weigh the risks and benefits of natural birth versus Cesarian section in her talk entitled “Decision Models for Mode of Delivery.” This caused more discussion than any other talk at the conference! Karen discussed how doctors have “rules” on when to decide a C-section would be better for the mother, but often times these rules are not based on any scientific evidence. Karen discussed how to weigh a scientifically informed decision based on a statistical analysis of the data. That evening, there was a banquet. The keynote address was given by Rudy L. Horne (Morehouse College). 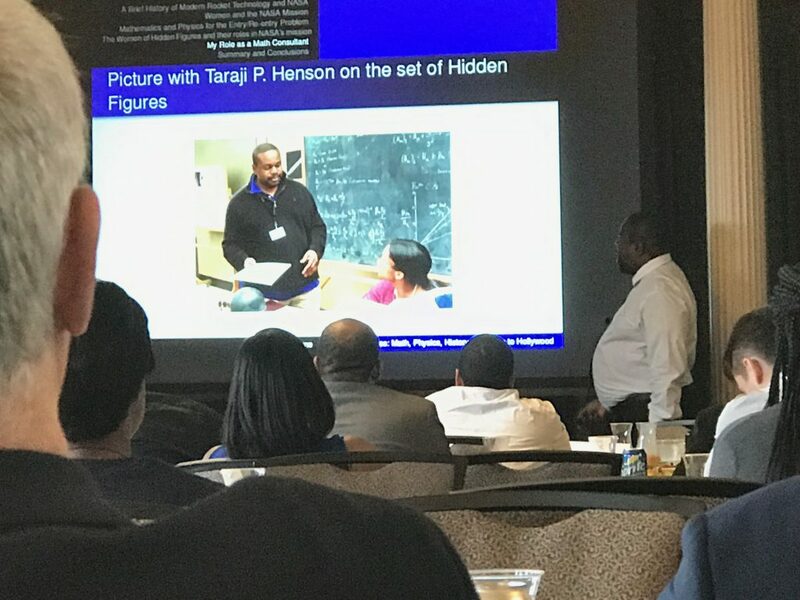 His talk entitled “Hidden Figures: Bringing Math, Physics, History & Race to Hollywood” gave a chronicle of his role as the main mathematics consultant for the movie Hidden Figures. This was a really great way to officially end the conference. Rudy and I have been coming to CAARMS since we were both graduate students, and it was great to see him now as a bonafide consultant for a major motion picture! Rudy presented hilarious story after story. And all of the men in the room now worship him because he got to spend time with Taraji P. Henson! These winners were asked to give short talks on the final day of the conference so that the conference participants could learn in more detail about their research. Where will CAARMS24 be held? Regardless of where CAARMS24 will be in 2018, I will definitely try my best to be there!